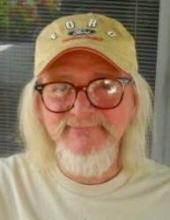 Leslie C. “Snookie” Harris, 67, of Henry, passed away Tuesday January 22, 2019, 7:10 am at his home in Henry. Memorial Services will be held Saturday January 26, 2019, 2:00 pm at the Calvert & Johnson Memorial Home, “Downtown Chapel” 416 Edward St. Henry, with an hour visitation prior to the services. The Rev. Terry Broady will officiate. Les was born December 11, 1951 in Streator, IL to Merlin and Dolores (Byrd) “Wright” Harris. He married Linda Knigge on August 28, 1999. She survives. Also surviving are two sons, Brad Miles, of Missouri, Tyler Harris, of LaSalle, one daughter, Hallie Weaver of Texas, Linda’s children, Joe Prosapio, of Twain, Dan Prosapio, daughter, Caitlyn Hoskins, both of Illinois, his siblings, La Donna Paisini, of WA, Debra Hall, Sandra Hayes and Kevin Harris, all of Illinois and Maureen Bridges, of Maine and numerous nieces and nephews. Les was the leader of several bands, such as the “Junction Band” and was president of Snookie West Productions. He was an artist and master carpenter and enjoyed antique wood working. "Email Address" would like to share the life celebration of Leslie C. Harris. Click on the "link" to go to share a favorite memory or leave a condolence message for the family.